The newest addition to the Chopin Single Ingredient Vodka Collection, Chopin Wheat Vodka is made from all natural 100% Polish wheat. 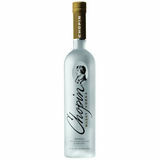 Created according to the highest artisanal standards, Chopin Wheat is the world's most elegant wheat vodka. Delicate bread dough nose, initial hints of honey on the front palate, finishing with notes of butterscotch and honey.